THE LONGSTANDING MISSION OF CITY ARCHITECTURE IS TO DESIGN BUILDINGS AND PLACES THAT COMPLEMENT THEIR NEIGHBORHOOD, ADD TO A CITY'S VITALITY, AND REFLECT OUR CLIENTS' VALUES. WE ASPIRE TO CREATE THE "PEOPLE PLACES" THAT PROMOTE A SENSE OF COMMUNITY. 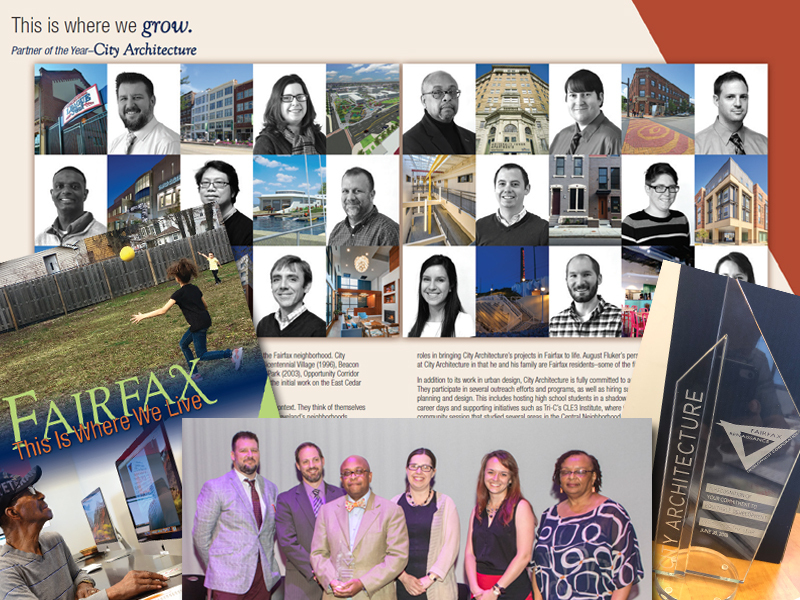 City Architecture is a 29-year Cleveland firm providing integrated services in architecture, planning, and urban design that is focused on creating places that are vibrant, responsive to their context, and reflective of their community. We work as a cohesive and motivated group on a wide variety of projects, and we have a track record of working with public and private clients. Our ability to understand multiple perspectives and consider varying aspects of projects has earned us a reputation of "neighborhood builders". We take pride in our shared success in delivering projects that represent our clients' vision and values. WE BELIEVE IT IS OUR DUTY TO BE RESPECTFUL OF OUR ENVIRONMENT AND TO ENSURE A HEALTHY FUTURE FOR SUBSEQUENT GENERATIONS. THIS COMMITMENT PERMEATES OUR DESIGN PROCESS AND INFORMS ALL THAT WE DO - SUSTAINABILITY IS AN INTEGRAL PART OF GOOD DESIGN. Our long-standing commitment to being a regional leader in sustainable design is demonstrated by experience with Leadership in Energy and Environmental Design (LEED) certified buildings and shaping many Enterprise Green Communities. This approach is rooted in our belief that investments in core communities are inherently sustainable and equitable. Connecting people's homes with their workplaces, shopping districts and recreational assets through walkable and bikable infrastructure investments reduces the need for vehicular travel. We believe this socially responsible approach includes offering choice and access. Simply stated, we believe in "green" for all. It is A great honor to have been recognized for our focus, dedication, and quality of work through a multitude of awards and honors. Due to our genuine community dedication, thoughtful designs, and high quality results, we are thankful for and humbled by the awards and honors received since our inception. They represent the commitment and passion we pour into every project, and we are incredibly proud that our clients and collective work have been recognized by over 200 awards and honors. We are honored to have been recognized with an AIA Ohio Gold Medal Firm Award, the highest honor the organization can bestow upon a firm, in recognition of consistent excellence in design and professional practice. We look forward to continuing active collaborations and making genuine differences in the communities we serve that focus on creating places of unique character and quality.